Help to setup Universal-Robots with Injection Mouldning Machine using Euromap 67 interface. 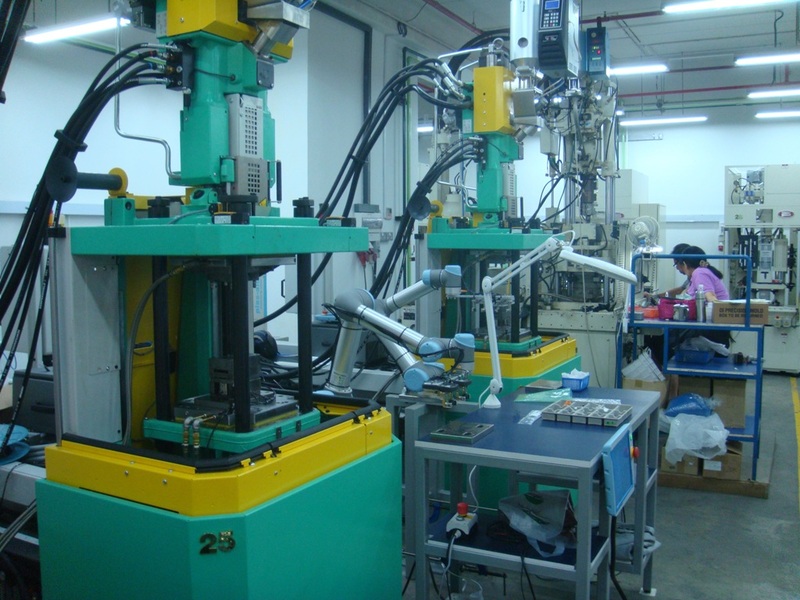 This example show a Universal-Robot tendig a Injection Moulding Machine (IMM) for insert mould i.e. 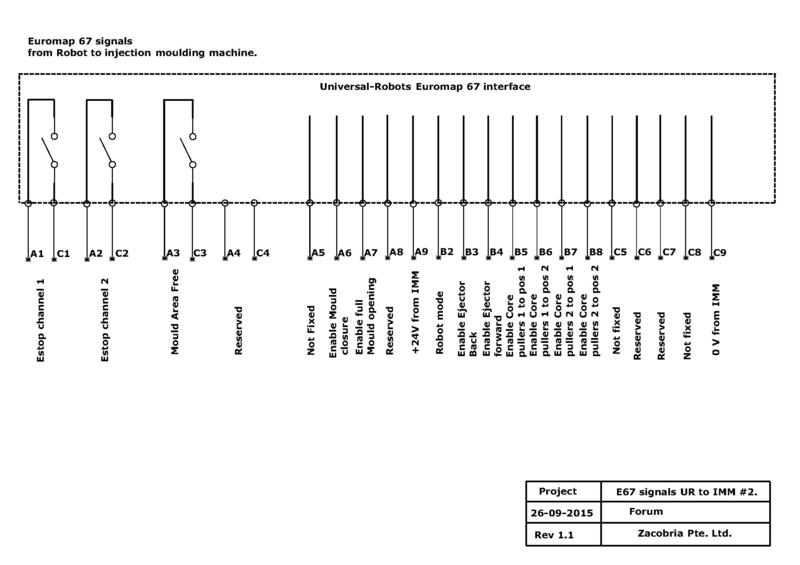 the robot will pick a part from a table and place that part into the IMM mould and when the moulding is done – then the robot will pick the same part out of the IMM again and place back on the table – so this can also be compared to a Pick & Place application and in this case the Euromap 67 interface between the Universal-Robot and the IMM is used. Since this type of IMM has a door that open and close between each mould cycle then also additional proximity sensors has been applied in order to detect when the IMM door is open or closed. There is also used proximity sensors to detect when a part is ready on the table to be inserted into the mould. And there is a sensor on the pneumatic chuck that pick the part out of the mould which detects if the “runner” is present and not stuck inside the mould . Therefore there is additional signal exchange aside from the E67 signals which are connected to the Universal-Robot input/output which can be seen on the diagrams below. The emergency stop and safety circuits are interlinked in a Euromap 67 interface and on some IMM the safety circuit will open when the door open on the IMM and then it might be necessary to work on that on the IMM. DI0 = IMM Door Open. DI1 = Item in position in gripper. DI2 = Check runner sensor on chuck. DI3 = Auto/Manual IMM switch. DI4 = Item in slot 1. DI5 = Item in slot 2. 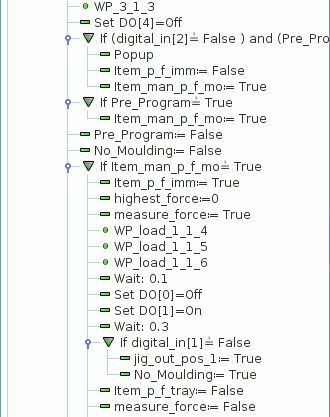 DI Tool 0 = Item in loading gripper. Figure 1: IMM inteface electrical diagram robot inputs. Figure 2: IMM inteface electrical diagram robot outputs. 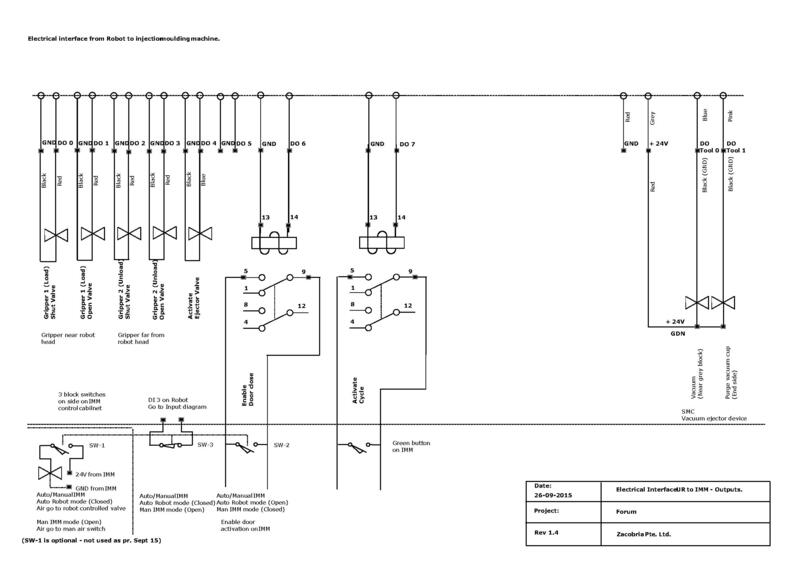 Figure 3: E67 IMM to UR electrical diagram. 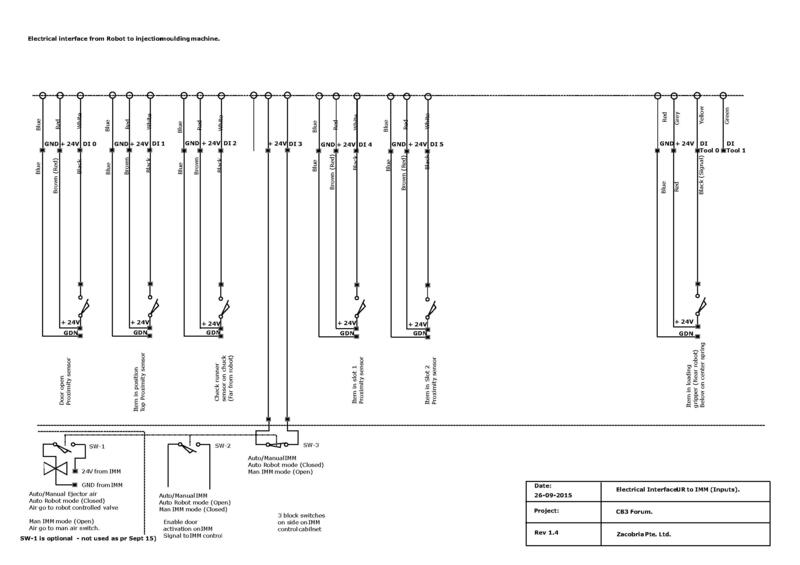 Figure 4: E67 UR to IMM electrical diagram. 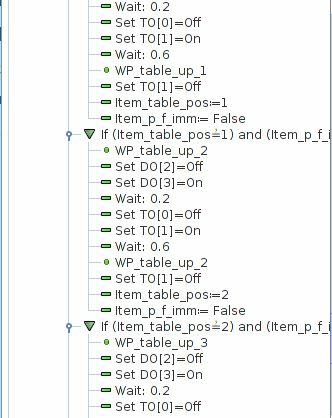 In the BeforeStart routine outputs and variables are set to a desired value in order to send signal to IMM that the robot is active. The first move of the robot is the release any items that might be still located in the gripper from previous run and there for the robot move to a place where it can open the gripper and let the item come out of the gripper. Then the robot await signal from one of the two proximity sensors that is located under each pick position in order to signal when an item is ready to be picked. When the signal is high the robot will pick an item and go to a waiting position just outside the IMM machine. 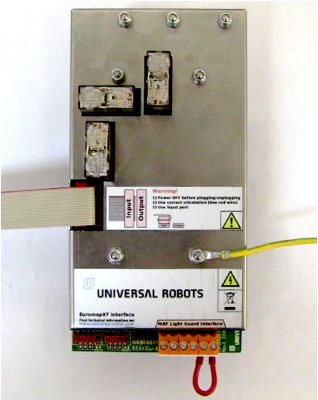 When the IMM has open the mould and open the door a signal mould area free through the Euromap 67 is set and also an external signal from a proximity sensor detecting the door is open – then robot move into the mould area and pick the processed item and insert a new item to be ready for insert mould. During this process the robot check several things. 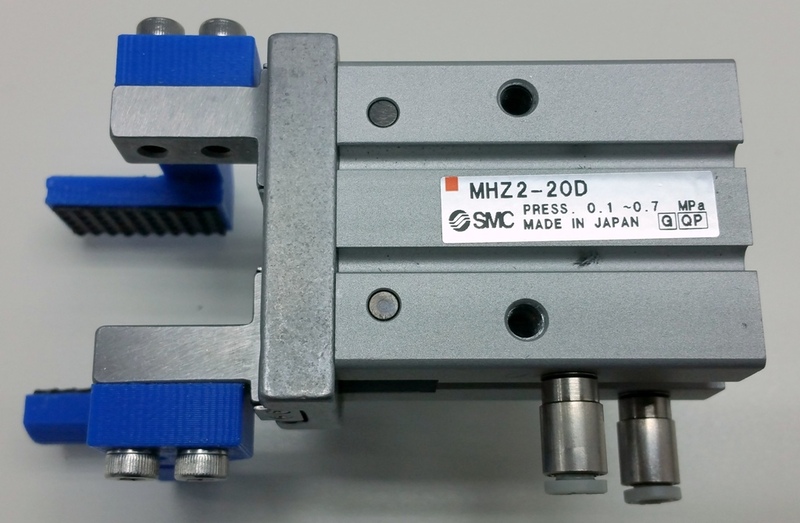 When picking the processed item from the IMM the gripper closes arround the “runner” – if the runner is not in place it can mean the runner is stuck inside the IMM machine and can cause error for next cycle if not removed. Therefore the robot will display an error messages if this occur – and the runner has to be manually removed by operator. 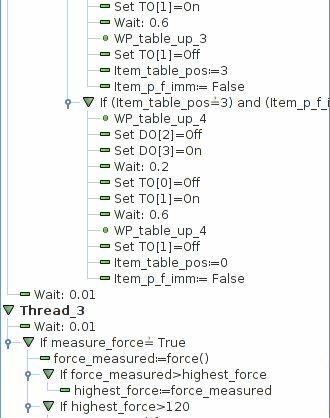 When the robot os placing an item in the mould – then the robot measure the force in a thread when going down and if the force is unexpected high it can mean there was to much obstruction and the item might be misplaced. Also the two proximity sensors on the gripper are checked at a position where the item must be fully down in the mould. 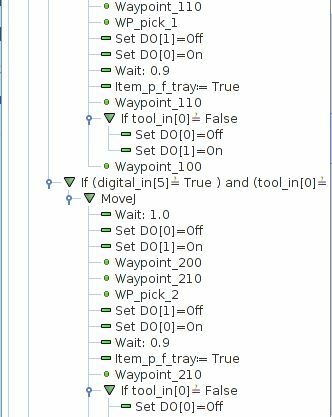 If one of these check misses then the robot will not give a “start cycle” to the IMM because the item is not placed correct inside the mould. Instead the robot will go out and place the processed item on the table and pick a new item to be loaded and try again. The robot will in most cases be able to pick the wrongly placed item and there for there is no error messages displayed for this event. 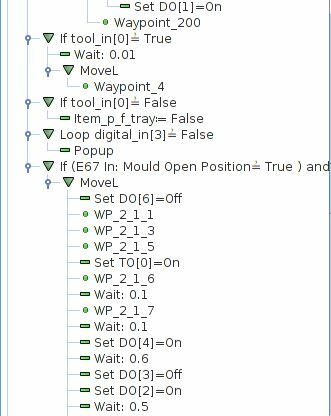 If the item is placed correct then the robot will go out from the mould area and when it is safely outside then it will send a start signal to the IMM which cause the IMM to close the door and start the mould cycle – at the same time the robot will move to the place position on the table and release the processed item. And then a new robot cycle starts. 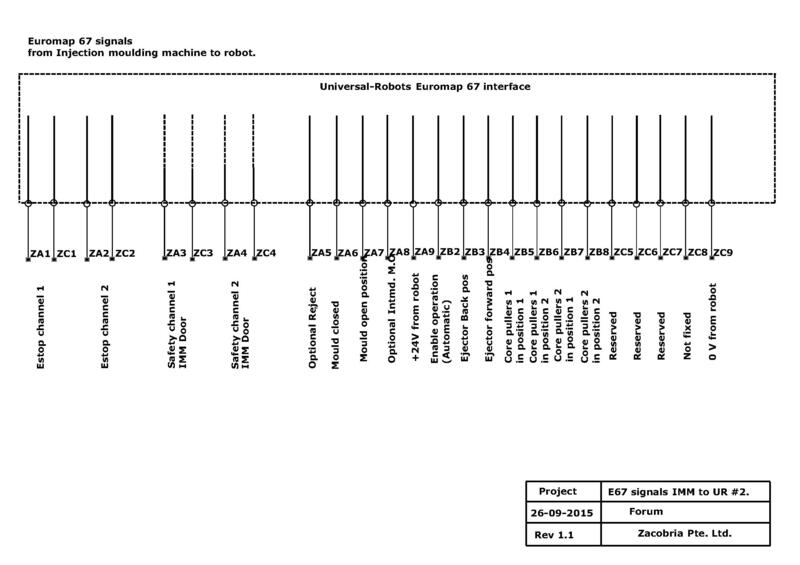 Euromap 67 Interface from Universal-Robots. 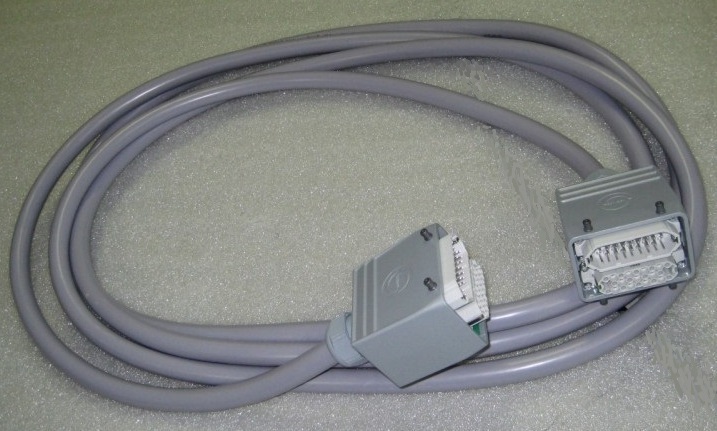 Euromap 67 Interface cable from Universal-Robots. I’m working on IMM application were parts will be picked from a conveyor after molded and placed then on bins. Due to safety sensors, proximity switches, and electric valves for the pneumatic required, I need to install an external power supply to handle the load. Is it possible to connect the external supply in a manner that can be turn on and off with the same power switch on the pendant? 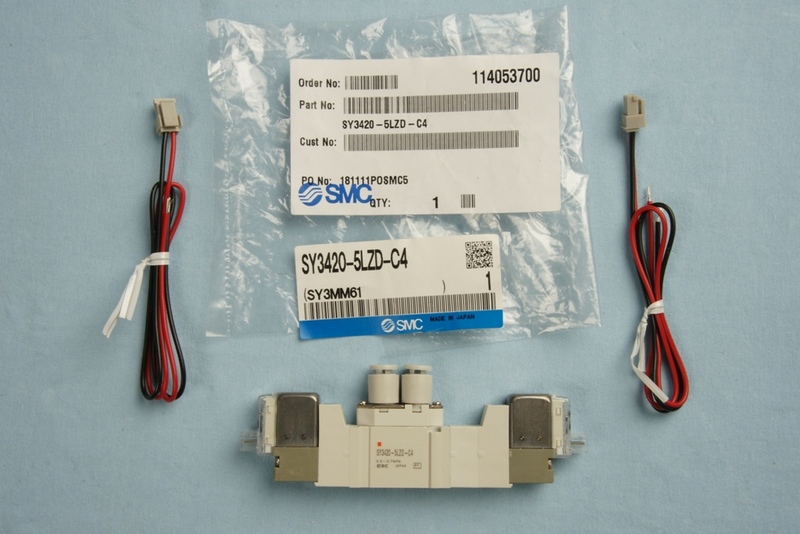 I have not seen an official way to connect anything that operate with the power switch. 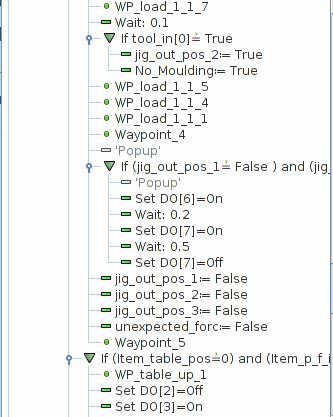 Maybe it can be considered to use the I/O power to turn on a relay when the power becomes ready after the robot has booted. Thanks for the answer! I think this is the way to go. I have a wittmann robot for injection molding machine euromap 67 ,i need to put it on bmb machine euromap 12 .some one help me to make wiring . This is a Forum for Universal-Robots. My imm machine has euromap 12 (16 male pins and 16 female pins) MY UR robot has Euromap 67 interface.. Can I still get this to work? Not without making some modifications which I have no experience for. Maybe consider to change the interface on the IMM to Euromap 67. So are company just got some sprure grabber robots. And they use a Euromap board. But we just ran into a problem with the robot. So the mold machine won’t close because it thinks the robot is in the mold machine. So it giving us a “robot in mold area free” do you now how to fix the signal from the robot to the mold machine. Which model of robot is used in the project ? The name of the robot is “borunte” it’s chiness. I am not aware of this type of robot. From UR to IMM, there are 3 relais to give the emergency signals. on the ather way, these relais are provided by the IMM? Considdering using a Euromap 67 interface so both the robot and IMM has been equipped with the optional Euromap 67 interface – then the robot has two relays for emergency to trigger the IMM for making an emergency stop on the IMM if the robot has emergency stop condition. 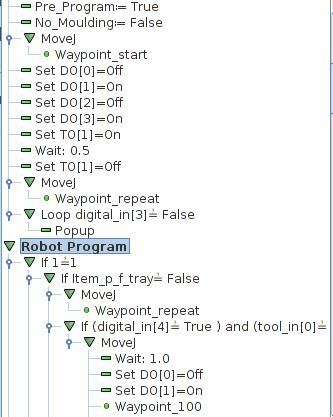 From the IMM to the robot there is 2 channels in the Euromap 67 interface that opens when there is emergency stop on the IMM and thereby trigger emergency stop on the robot. The Euromap 67 interface is optional on the UR – and the Euromap 67 interface is not always available on the IMM depending on the brand and model of the IMM. Some IMM can offer the Euromap 67 interface as an option. Can UR receive signal on E67 interface ? 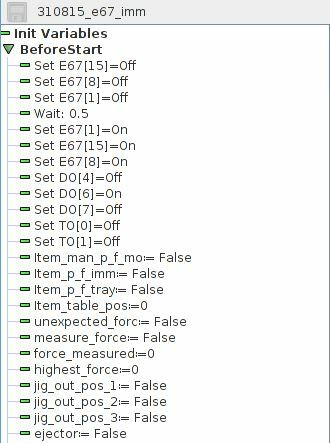 Does E67 have Estop function ?